Lez be honest real quick. there's no way I'm wearing any makeup. 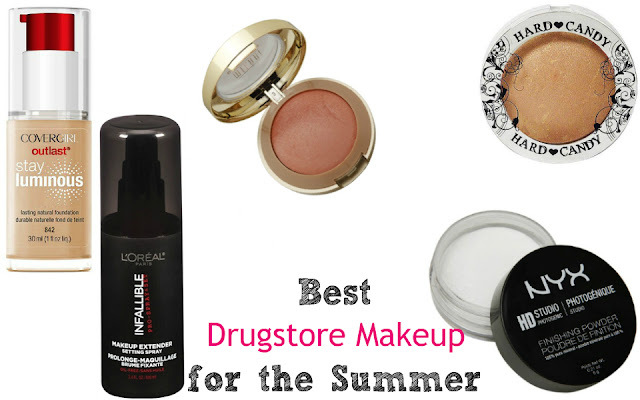 But I do have some go to makeup from the drugstore that I use on a daily basis in the summer time. Most of it has "luminous" properties, because I like the glowy look during the hotter months. AKA I like looking like a disco ball while sweating. Covergirl Outlast Stay Luminous Foundation - 1st off can they make a longer name for this?! I think not. But that aside, I love this new foundation. It has a pump which makes it awesome already in my book. Plus it goes on smoothly and doesn't come off 1/2 way through the day. Hard Candy Baked Bronzer - I bought this while on vacation at Walmart & I friggin love this stuff! It blends pretty good and gives me an all over glow. This is definitely NOT a contouring bronzer, but for a nice all over the face bronzer, this is awesome! I love this stuff! It's finely milled, and goes on like a dream. Not heavy at all and keeps everything in place all day long. Milani Baked Powder Blush - I only wear one color from this line... Luminoso. It's my absolute favorite blush I own! I always reach for it. I almost hit pan already! Loreal Paris Infallible Makeup Setting Spray - I bought this when it 1st came out a few months ago and LOVE it. I have almost finished the bottle. But it's amazing and really does set my makeup all day long. It's a lifesaver in the heat and humidity! What are your go-to products for the summer?